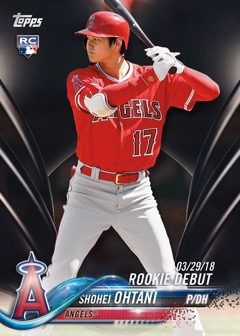 2018 Topps Update Series Baseball arrives Monday, October 22nd at Sports Cards Plus rounding out the season’s flagship line with more rookies, more traded players and some in-season highlights. 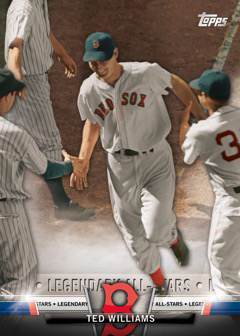 It also brings the Topps Silver Pack promotion to the Update Series for the first time. 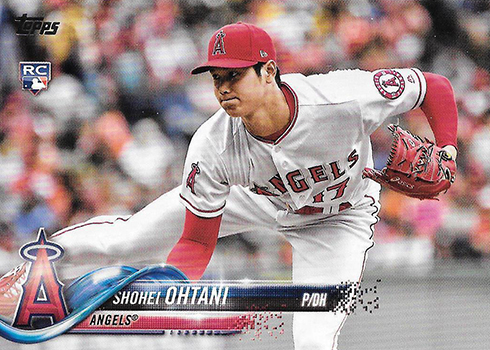 The 2018 Topps Update Series Baseball main set has 300 cards, including rookie call-ups from the early part of the season, season highlights and veteran trades. 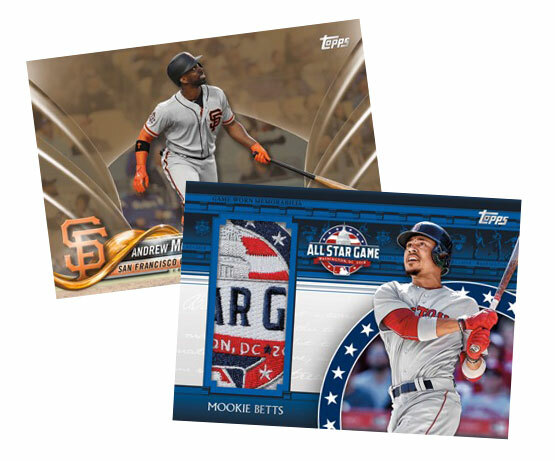 Other base set subsets spotlight specific events including Rookie Debuts, the All-Star Game and the Home Run Derby. Although the Update Series is numbered differently than the combined 2018 Topps Series 1 and Series 2 it’s very much a continuation. Parallel collectors won't be disappointed, there are lots of them. The rainbow resembles that of the earlier sets, but different. While most parallels are numbered, Rainbow Foil are not. These are 1:10 hobby packs. Among the other parallels available in both hobby and hobby jumbo packs are: Gold (/2018), Vintage Stock (/99), Independence Day (/76), Father’s Day Powder Blue (/50), Mother’s Day Hot Pink (/50), Negative, Memorial Day (/25), one-of-one Printing Plates, and Platinum (1/1). Black versions are exclusive to hobby and hobby jumbo packs and come numbered to 66. 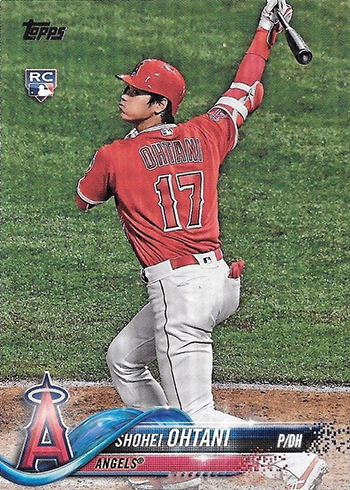 Variations return in 2018 Topps Update Series Baseball. These are available in two tiers, short prints and even tougher super short prints. Some of these also have autograph versions. 1983 Topps Baseball gets a third installment in 2018 Topps Update Series Baseball. These are new inserts of current players and rookies done with the design of the 35-year-old set. Parallels come in several colors: Blue, Black (/299), Gold (/50), Red (/10) and Platinum (1/1). Some of the 1983 Topps cards also have autographs. These have parallels of their own: Black (/99), Gold (/50), hobby-only Red (/10) and hobby- and hobby jumbo-exclusive Platinum (1/1). Another continuing insert is Topps Salute. These look at various themes from both the past and the present. This time around, it’s Game Changers, Legendary All-Stars and Rookies. Basic parallels match 1983 Topps. Salute also has signed versions, however autographs only have Red (/25 or less) and Platinum (1/1) parallels. 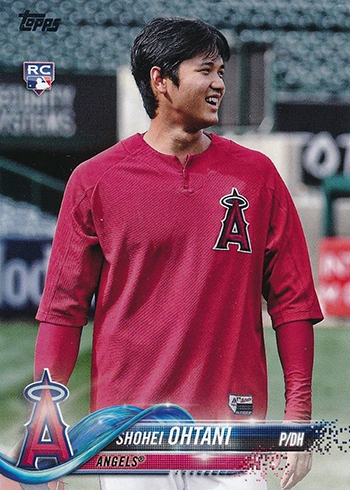 2018 Topps Update Series Baseball has three new regular insert sets as well. Don’t Blink centers on the sport’s speedsters throughout history. An International Affair spotlights players from all corners of the globe. Storybook Endings retell the tales of final seasons of featured players. All three of these come with an assortment of parallels: Blue, Black (/299), Gold (/50), Red (/10), and Platinum (1/1). Some cards in each of the sets have autographs that have no more than ten copies each. On the manufactured relic side, there’s MLB Postseason Logo Patch cards. The checklist has recent players who helped their teams make the playoffs. Parallels come in Gold (/99), Blue (/50), Red (/10) and Platinum (1/1). Autographs are numbered to 10. 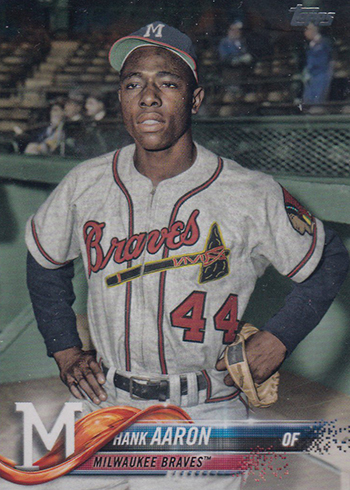 Jackie Robinson Day Commemorative Patch cards are only in select retail blasters. These come with a recreation of the patch worn on players’ jerseys. Gold (/99), Blue (/50), Red (/10) and Platinum (1/1) are the parallels. Select players have autographs (/10 or less) as well. 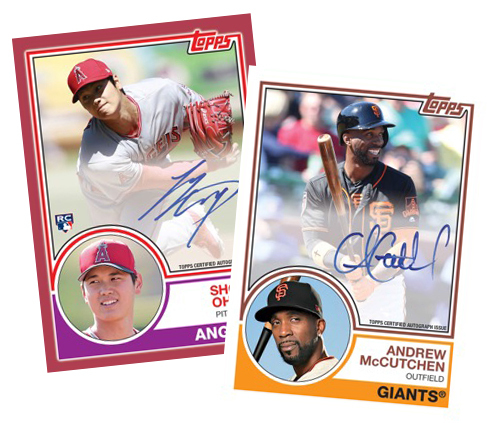 2018 Topps Update Series Baseball has other autographs and relics beyond premium versions of existing inserts. There are plenty standalone hit inserts as well. Autographs and memorabilia cards combine to land one per 2018 Topps Update hobby box. Hobby jumbo boxes promise one autograph and a pair of relics. 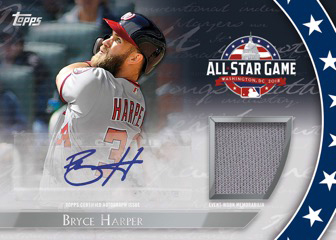 The Midsummer Classic is the focus of many of these starting with All-Star Stitches. These have swatches from gear used during the All-Star festivities. Historically, they’ve been warm-up jerseys. Parallels include Blue (/50), Gold (/25) and Red (1/1). Dual and Triple versions have 25 copies each. All-Star Jumbo Patch cards are numbered to 5 or less and have one-of-one Platinum versions as well. All-Star Stitches have some autographed versions, too. Basic autographed relics have 25 copies or less along with Gold (/10) and Red (1/1) parallels. All-Star Stitches have similar numbering as well as parallels. Signed versions with jumbo patch pieces have Gold (/10) and Platinum (1/1) parallels. Own the Name (1/1) have letter patches from jersey nameplates. These are only in hobby and hobby jumbo packs. Topps Reverence Autograph Patch cards (/10) continue from the earlier 2018 Topps Baseball sets. Limited parallels are Red (/5) and Platinum (1/1). A limited number of Cut Signatures are also randomly inserted. The Topps Silver Pack program wraps up its second year by making its Update Series debut. 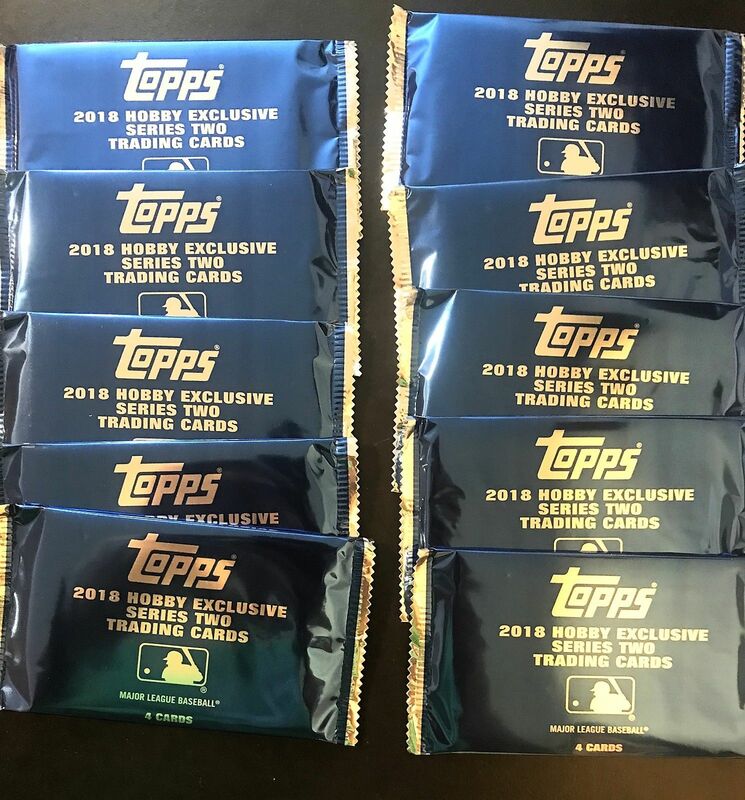 These are bonus packs intended to be used as incentives for dealers to give to collectors buying hobby and hobby jumbo boxes. At Sports Cards Plus, you get one 2018 Topps Update Silver Pack with a hobby box and two with a hobby jumbo box. Inside Silver packs are exclusive Chrome versions of the 1983 Topps inserts. These come with a patterned background to make them standout further from the inserts in Topps Chrome. 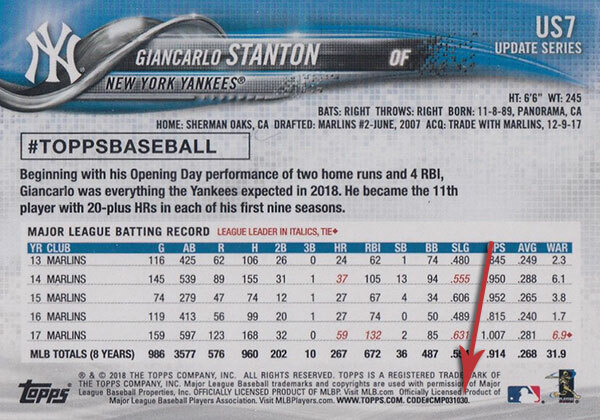 2018 Topps Update Series Baseball variations offer a similar sort of continuity from the Series 1 and Series 2 SP cards much like other parts of the product. These cards offer up a different mix of fresh photos for stars and rookies. It also means the addition of more retired legends. 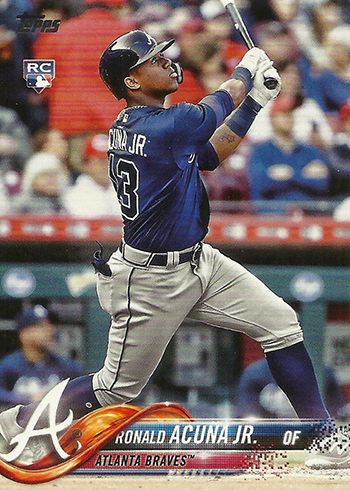 Topps also managed to work in some of the late-season trades. These put the likes of Andrew McCutchen and Josh Donaldson with their new teams. Another piece of continuity comes from the cards’ two levels of rarity. 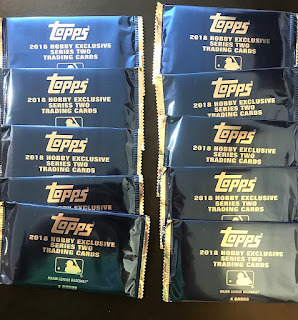 Regular SP variations are 1:45 2018 Topps Update hobby packs. Tougher SSP variations are 1:273 hobby packs. Combined, they’re a little tougher than one per box at this level. Overall, the more common versions shouldn’t be too tough to find, both at the time of the set’s release and further down the road the big wave of breaks happen. SSPs, though, could prove to be tough over time if past years are any indication. Once again, card backs offer a confirmation as to whether you’ve got a short print variation. At the end of the fine print is a code that’s used on the production side. They double as identifiers for collectors, even if that’s not the intent. Once you get past all of the copyright info, look to the last few digits of the code and they’ll tell you what you’ve got. Several of the 2018 Topps Update variations also have autographed versions. These were all revealed on the checklist put out by Topps, but not the unsigned ones. Here is a list of the variations as we know at this time.